One of my favorite parts of the fall season are the tastes and scents that are so popular. While I realize that some people hate to see the popularity of pumpkin flavored everything, I can't get enough of it. 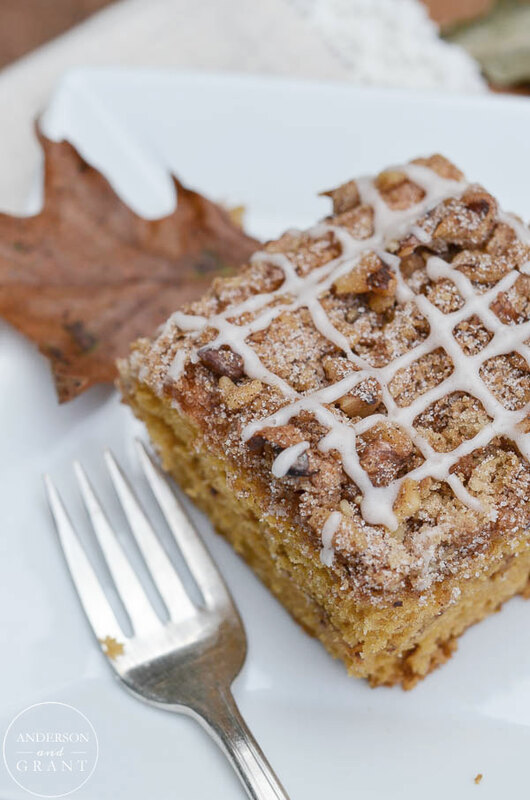 So if you are one of the types that cringe whenever you see a new use for pumpkin, this post is not for you. 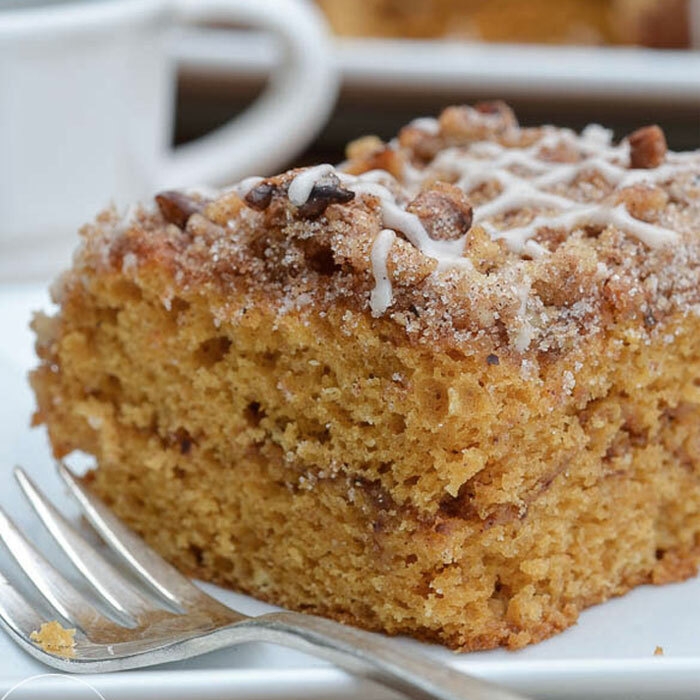 For those of you who are like me, you may also want to check out all my favorite pumpkin recipes for fall! Today I'm sharing a recipe for Pumpkin Spice Coffee Cake. 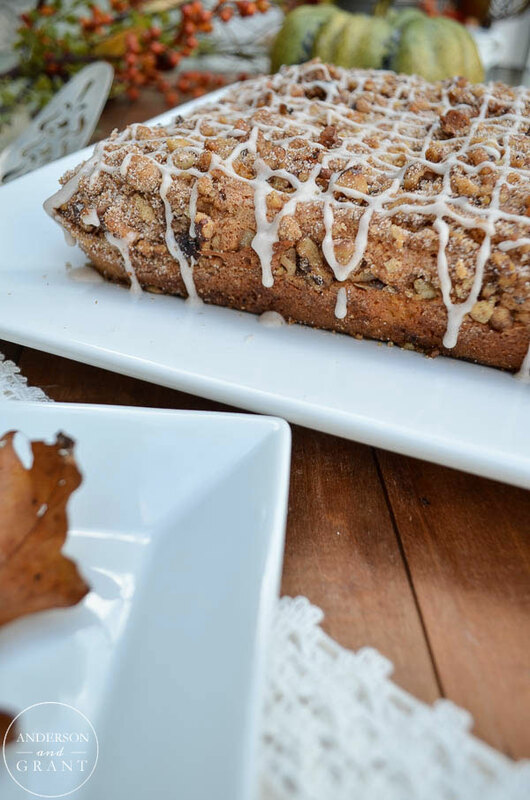 It is a twist on my Pistachio Coffee Cake that I shared a few years ago for St. Patrick's Day and could not be easier to make. Normally I'm very much a make-it-from-scratch kind of baker, but this is one of the few exceptions. There are times when a box cake mix works just fine......times when baking something is good enough. And if you don't feel like you're great in the kitchen, this is a cake that even you can handle. 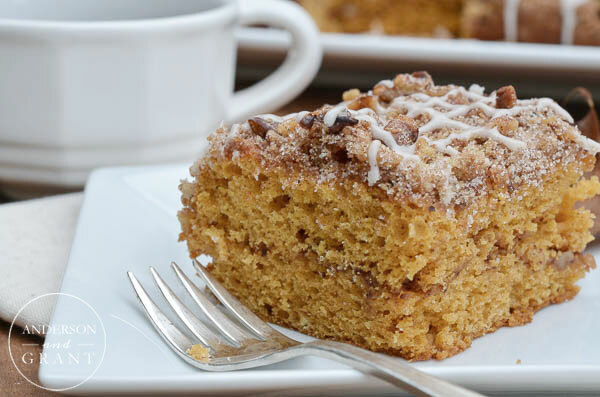 Although coffee cake is traditionally for breakfast, this can also be served for after-dinner dessert or snack as well. 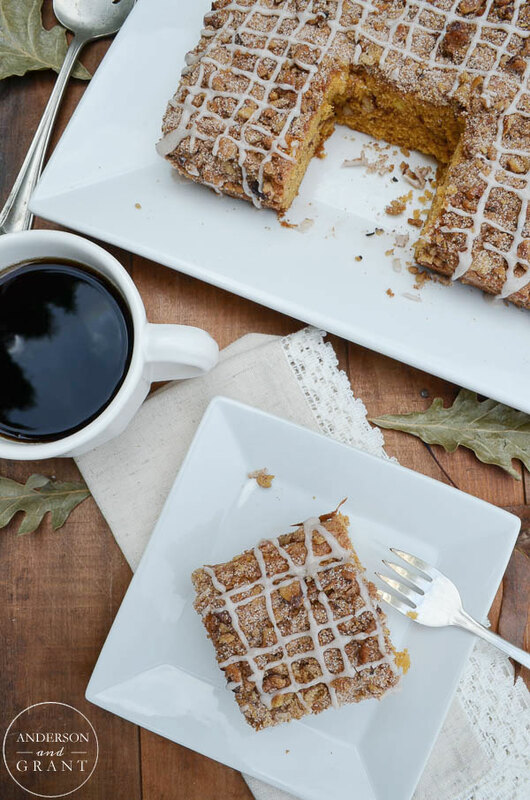 This Spiced Pumpkin Coffee Cake will give you a perfect bite of fall regardless of when you decide to indulge....cinnamon, pumpkin spices, walnuts, and pumpkin flavors all combined together and topped with a drizzled glaze. Yum! It is a very moist cake, even days after it has been made. And look at the vibrant pumpkin color when you cut into a slice! 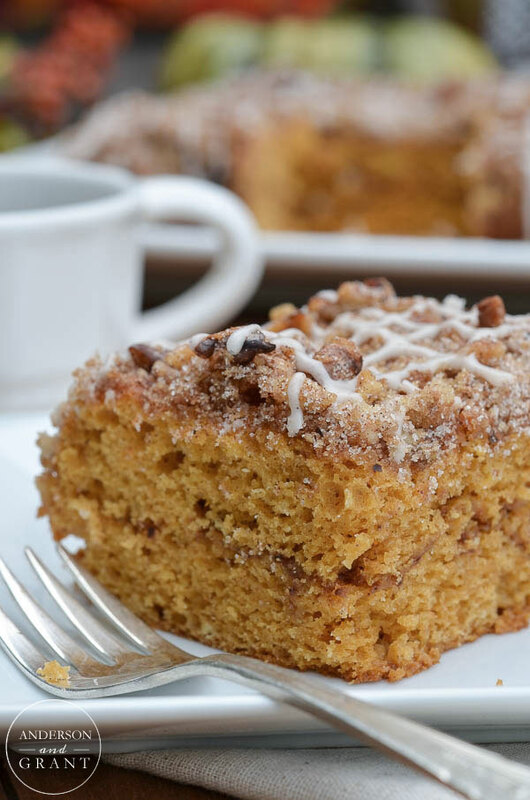 If you are like me and enjoy finding new pumpkin recipes, then this one is for you. I'd love to know what you think! To make the cake: In another larger bowl, mix the eggs, water and cake mix together until blended and smooth. Add the dry pudding mix, oil, and sour cream and mix until combined. Grease a 9x13 inch pan. 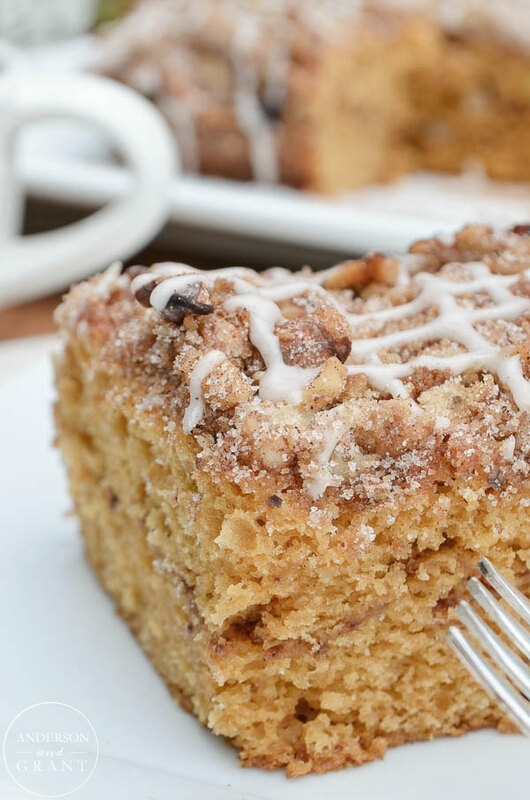 If you'd like to be able to remove the coffee cake from the pan in one piece when it was done baking, add a piece of parchment paper to the inside of the pan leaving a few inches of overhang on both long sides of the pan. Put half of the batter into the pan and then add half of the mixed topping. Carefully spread the rest of the batter on top and finish the cake off with the rest of the topping. Bake the cake in a preheated 400 degree oven for 30 to 35 minutes or until the cake tests done with a toothpick inserted in the center. Allow the cake to cool on a wire rack. When the cake is no longer warm, mix up your glaze. Whisk together the confectioner's sugar and pumpkin pie spice. Add two tablespoons of milk. If the glaze seems too thick, add more milk a teaspoon at a time. Pour the glaze into a piping bag (or a ziploc bag with the tip cut off works just as well.) Drizzle the glaze over the top of the entire cake. 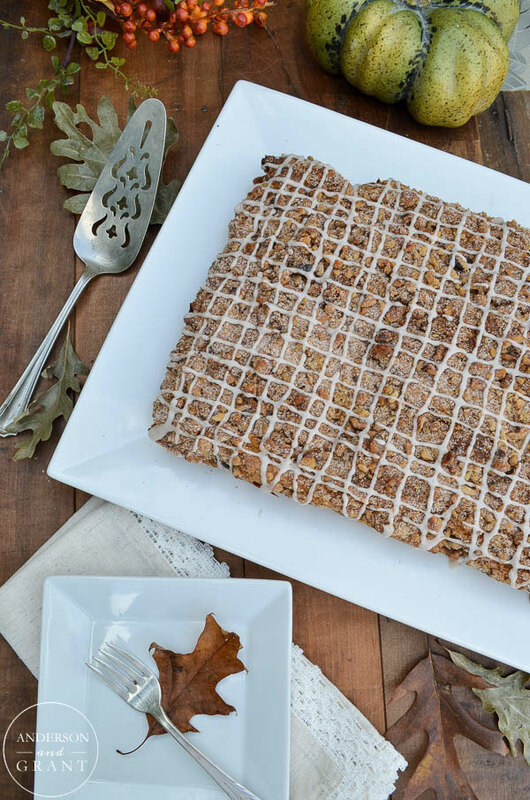 Pour yourself a cup of coffee and enjoy this delicious fall cake!